Being able to grind your own coffee beans before you brew your coffee is a great way to ensure that you’re getting the freshest cup of coffee possible. And with more and more coffee machine manufacturers opting to create models that can both grind the coffee beans and then brew them, it’s easier than ever to have that great cup of coffee. However, having so many different models on the market can also create a bit of confusion. Which model is the best grind and brew coffee maker out of all of the ones on the market and which ones deliver the best value? Questions that can only be answered by delving into the features of these coffee machines and seeing what they have to offer. The KRUPS EA8250 Espresseria Coffee Maker is a fully automatic coffee maker that not only has a nice compact size but also has a nice design that allows it to sit in just about any kitchen and not look out of place. However, size and style isn’t the only good thing about this machine. It also has a number of features that makes it a great grind and brew machine. One of the first features that needs to be mentioned is its integrated conical burr grinder. It’s a grinder that can ground beans finely for espresso or on a coarser setting for coffee. This coffee maker also uses thermoblock technology that brings the water temperature up to optimal coffee temperature levels. Some other great features that can be found in this unit include an LCD screen, the ability to select coffee size and type and controls that are easy-to-use. It also has a large 60-ounce water reservoir that keeps you from having to refill the water after each cup of coffee or espresso. Some coffee enthusiasts only want a machine that brews a single cup of coffee at a time and don’t want to purchase a machine that is going to produce more than they need. In those instances, the Hamilton Beach 49989 is a coffeemaker that’s just waiting to fulfill their needs. This single-serve coffee brewer can grind whole beans and then brew them or can simply brew your favorite coffee grounds depending on what you need. It can then dispense coffee into a standard cup or travel mug or can deliver it into 2 separate cups thanks to its dual-stream system. And when the day’s grinding and brewing is completed, this unit has an automatic rinse feature that can clean out the bean chamber to prevent it from clogging. These features make it not only easier to make a cup of coffee but also more likely you can get a tasty cup of coffee that’s hot and fresh. The Capresso 464.05 Coffee Team Gs Coffee Maker is a grind and brew machine that’s not only fully automatic but also programmable. It has a 24-hour programmable clock and LCD display that allows you to see what time it is and what grind and strength settings you have set for the machine. It also has a stainless-steel conical grinder that can be adjusted to 5-different fineness levels depending on your personal preferences. This unit also features a large 6-ounce bean storage unit that holds enough beans for up to 20-cups of coffee. Other features of this coffee maker include a brew-pause that pauses the brewing so you can sneak a cup of coffee, 2-hour safety shut off and a brewing temperature of 200-degrees. Everything you need to create that fresh tasting cup of morning coffee. The Cuisinart DGB-900BC Grind & Brew Coffee Maker is a machine that can not only grind and then brew your favorite coffee beans but also has a number of other features that make it a really useful device for the coffee enthusiast. Let’s take a look at a few of these features. It has an 8-ounce bean hopper and an automatic burr grinder that makes grinding your coffee beans and brewing your coffee quick and easy. And if you want to use coffee ground instead of beans, it has a grind off button that makes that a distinct possibility. Other features of this coffee machine includes a programmable 24-hour clock, thermal carafe that can hold 12-cups of coffee, a charcoal water filter and a permanent gold-tone reusable filter. All of these features allow you to create a nice hot cup of coffee from scratch without a whole lot of trouble. Stylish and modern in its design, the Breville BDC650BSS is a coffee maker that would fit in at just about any home or office. Sporting a beautiful LCD screen, users can make coffee exactly to their specifications – either a single cup or an entire carafe. This machine has a stainless-steel burr coffee grinder, a removable drip-tray, programmable auto-start and eight coffee strength settings. If you want to use ground coffee instead of coffee beans, you also have that option. It also has a 60-ounce unit that holds enough water to do twelve 5-ounce cups of coffee. Water which it raises to an optimal coffee brewing temperature thanks to its innovative ‘Steep & Release’ technology. It’s a coffee brewer designed for the modern coffee enthusiast. The Cuisinart DGB-650BC is a nice looking coffee maker with a modern design that not only makes it easy-to-use but also makes it quite a nice machine to have in your home. It has a number of features which can make it a valuable coffee brewer to the home consumer – including a 1-to-4 cup setting and automatic brew settings. Once you have filled this unit with water and coffee beans and have set it, it will then get to work. It will grind the beans into the brew basket and then it will run charcoal filtered water at exactly the right temperature over these grounds producing an excellent cup of coffee. And although this machine is a tad noisy and may need to be cleaned more regularly than some other coffeemakers, it’s still a pretty good machine that makes a very nice cup of coffee day in and day out. While most people know the Black & Decker name from their fine collection of power tools, many people don’t realize they also have a line of coffee makers like the Black & Decker CM5000B. A machine that’s rather inexpensive for the features it delivers. It has a permanent filter that’s also the grinder that is easy to remove so it can be cleaned, although removing it can be a messy task at times. It also means that you can use either coffee beans or your own coffee grounds. This unit also has a layer of insulation to keep down the sound of the grinder when it’s in use. With this coffee machine’s quick-touch programmable buttons you can adjust grind, brew strength and number of servings quickly and easily. Other features included in this coffee maker include a 24-hour brew timer, automatic shutoff and an LCD display that tells you how long it’s been since your coffee finished brewing. All of these features will help you begin to think of this company as a quality coffee maker manufacturer and not just a company that produces power tools. The DeLonghi ESAM3300 Magnifica is not only a grind and brew machine but it’s also a beautifully designed espresso machine in its own right. It has an adjustable integrated conical burr grinder that allows you to go from grinding your coffee beans to brewing your coffee in just a few moments. One of the great features about this espresso machine doesn’t have anything to do with coffee bean grinding. No, it has to do with its patented cappuccino system that mixes milk and steam to create a nice frothy foam to place on top of your coffee. This machine also has a cleaning light that tells you exactly when it needs to be cleaned. This machine will not only deliver a fresh cup of coffee but will also allow you to create a nice cup of espresso. All you have to do is choose your settings and let it do all of the work for you. The Jura ENA Micro 5 is a fully-automatic espresso and cappuccino maker. It uses a bean to cup system that takes all of the hard work at making your favorite coffee specialty drink. It will grind the beans and then brew the coffee to make one or two cups of coffee. A great feature about this machine is that it has a rotating spout system. When it’s set one way, you can make 2-cups of coffee at one time. When it’s turned the other direction, you can then make a single double shot. The grind of the beans can be adjusted from coarse to fine, allowing you to grind the coffee to your exact needs. When you’re finished brewing, you can remove the tray and dispense of the spent grounds making clean up quick and easy. All in all, the Jura ENA Micro 5 might be a bit on the expensive side but it does produce some of the best tasting espresso and cappuccino drinks. All thanks to a fully-automatic design by people who evidently know what it takes to brew coffee. The Breville BES870XL is an espresso machine that has all of the features you would expect to have in the best grind and brew coffee maker. It’s stylish and has an integrated conical burr grinder that’s right on top of the machine and is easy to reach. Of course, it has a number of other features that are also quite good. Ground size can be set from fine to coarse and has dose control that allows you to put the right amount of coffee through the filter every single time. 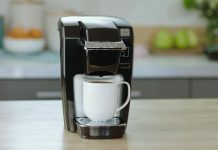 It also has buttons that are programmed for either 1 or 2-cups of coffee, or if you need more control, a program button that allows you to customize how much coffee ends up in your cup. Other features you’ll find on the Breville BES870XL is a pressure gauge, dedicated water spout, a removable 67-ounce water tank and 15-bars of pressure. This is one of the best grind and brew coffee maker machines that can be found today and is sure to make many coffee lovers happy. Some people think that grind and brew coffee makers are so easy-to-use that you probably don’t even have to read the instructions. 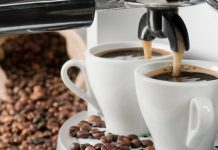 While they do simplify the process of grinding and making coffee, they aren’t exactly foolproof and it’s certainly not recommended to skip reading the instructions that come with the machine. Not unless you intend on either ruining the machine or it not operating the way it’s supposed to operate. There are also some people who like to have an idea of how a particular machine operates before they purchase it. If that describes you, then you might want to stick around for this article. That’s because we’re going to go over some of the steps involved in using one of these great machines. So if you have some time and are ready for a little bit of fun, then let’s get this party started. For the purposes of this article, we used a Cuisinart grind and brew machine for the outline of our steps. This means that this article is just a general overview and might not accurately depict your particular machine’s steps. Always be sure to consult with your machine’s instructions and follow their recommendations. Make sure that you remove any packing material and make sure that your machine is properly assembled. Once that’s been done, you can then plug in your machine and use the control panel to set the digital clock. There’s both an hour button and a minute button, so you can use these buttons to set the current time. Just be sure that it’s set to the proper time of day—either A.M or P.M. Once you’ve done that, all you generally have to do is wait a few seconds and the selected time will be set. With the time properly set, we can now work on programming the unit. Hold down the Program Set button for a few seconds until the display screen begins to flash. Now, use the Hour and the Minute buttons to program the unit to the appropriate start time. Wait a few seconds and the unit will save the start time. Now hold down the On/Off button and wait for the display screen to begin flashing the auto shutoff time. As you did setting up the unit’s start time, use the Hour and the Minute buttons to set the shutoff time. Our particular model could be shutoff up to four hours after the brewing process has finished, but yours may be different. If your unit has a charcoal filter, then be sure to soak it for a few minutes before you use it. On most coffee machines that have built-in filters, you generally need to soak the filter for approximately 15-minutes before you run it under cold tap water for several seconds and then install it in the machine. Generally speaking, you should replace the water filter after 60 to 65 brew cycles for best results. 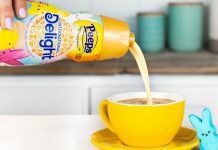 Now you can add water to your coffee machine. For the best results, make sure that you use distilled water in your machine and that you don’t overfill the machine. Yes, we know the machine has a water filter in it, but I’ve found that using distilled water extends the life of this filter and keeps the water reservoir clean. Of course, if you don’t feel its necessary, you can proceed using the water you choose to use. The next thing you are going to want to do is to add your favorite whole coffee beans to the machine. To complete this step, unlock the hopper from the machine and remove the basket. Now fill it with your beans and replace the basket to the machine. When it’s securely in the machine, turn the knob on the hopper to the Locked Position. Be sure that you don’t add more than what your machine recommends. This is usually around 8-ounces of beans. Once you’ve finished adding the beans, you can then proceed to add the coffee filter in the filter basket. Now close the door. Using the cup selection knob, select the number of cups you want to brew and also select the strength of the coffee using the appropriate knob. Your coffee maker is now ready to brew you a nice cup of coffee. Okay, we can’t leave good enough alone. While we’ve covered the top models currently available and have shown you some tips on how to get the most out of the said machine, we don’t want to leave it there. We also want to give you some tips on brewing a better cup of coffee, so let’s dive right into this subject with the following tips. Buy the Best Whole Beans Possible—If you want a good cup of coffee, then you’re not going to want to skimp on your coffee bean selection. Always be sure to buy the best beans possible to get the best possible cup of coffee. Trust me, if you buy low-quality coffee beans, you’ll be able to taste it in your coffee cup. Store Your Coffee Beans Properly—You’ll also want to make sure that you store your coffee beans in an airtight container in a dark portion of your cabinet. This will keep your beans as fresh as possible until you’re ready to use them. Keep Your Machine Clean—Another thing that you can do to keep your machine in good working condition is to clean it out on a regular basis. When cleaning your machine, be sure to follow your machine’s instructions. Descale Regularly—If you live in an area with hard water, then you are going to have to make sure that you descale your machine on a regular basis. Once again, we suggest that you consult your machine’s instructions for the best way to accomplish this task.